The Waupaca Area is known for its natural beauty highlighted by the Chain O’ Lakes, a body of 22 interconnected lakes with crystal clear emerald waters. The ‘Chain’ offers water sport enthusiasts opportunities for boating, dining and touring. For those looking for a quiet paddle, the ‘Upper Chain’ offers the opportunity to explore five no-wake lakes separated from the main chain and not accessible by larger power boats. Those who wish to enjoy a more leisurely tour of the Chain can hop aboard the Chief Waupaca, an authentic double decker paddleboat, or the Lady of the Lakes motor yacht for a tour of the lakes. 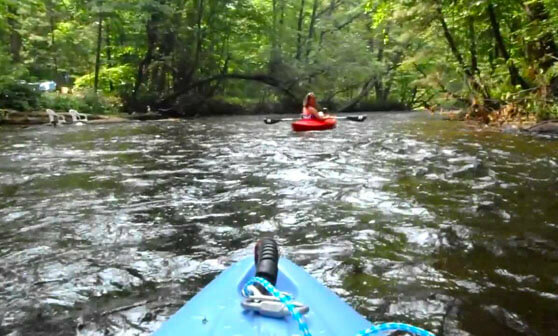 In addition to the Chain, the Crystal and Waupaca Rivers offer canoers, kayakers and tubers a relaxing trip through the natural beauty of the Waupaca countryside with a few sections of small rapids for a few moments of excitement along the way. For a guided trip, visitors can choose from a variety of outfitters and marinas. Off the water, the Waupaca Area features trails for all seasons. Bicyclers can enjoy a variety of terrain including quiet rural roads, off road family friendly trails or single-track in Hartman Creek State Park. When the snow falls, Hartman Creek State Park and the Iola Winter Sports Complex provide opportunities for cross-country skiing, snowshoeing and fat tire biking that are second to none. The Waupaca Area is also home to over 40 unique shops. From gift shops to children’s book stores to women’s clothing stores, Waupaca has a selection of shops for you to explore. Don’t forget to take a break once in a while to recharge with a meal at one of our many area restaurants. Select from an authentic Irish pub, water front dining on the Chain or fine dining at a traditional Wisconsin supper club downtown. And at the end of the day, relax at one of our many area lodging facilities including modern hotels, quaint B&B’s and campgrounds.